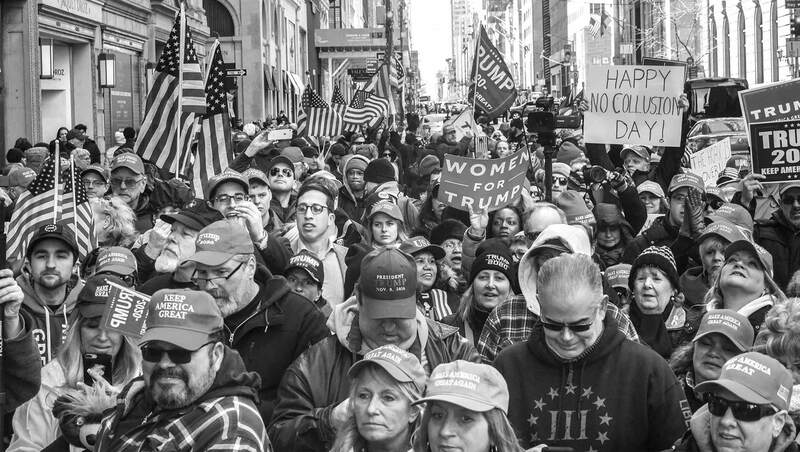 WASHINGTON, D.C. -- White Americans without college degrees helped propel Donald Trump to an upset victory in the 2016 election and have been one of his most supportive subgroups during his presidency. The group's support for Trump may largely reflect their political leanings as much as their affinity for Trump, as currently, 59% of non-college whites identify as Republicans or say they are independents who lean toward the Republican Party. But non-college-educated whites were firmly aligned with the GOP well before Trump announced his presidential candidacy on June 16, 2015. In 2014, 54% of whites without college degrees identified as Republicans or were Republican-leaning independents, compared with 34% who were Democrats or Democratic leaners. 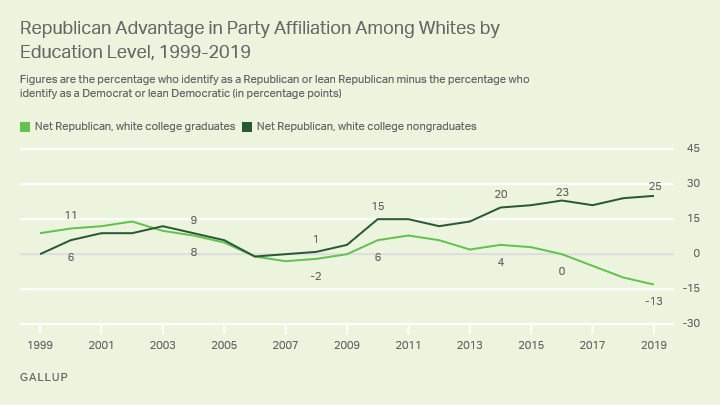 In fact, white college nongraduates have preferred the GOP to the Democratic Party for most of the past two decades, with at least a slight Republican advantage in affiliation for 15 of the past 20 years. The exceptions were in 1999, the year of the Republican-led Senate trial attempting to remove President Bill Clinton from office, and 2006 through 2009, troubled years for the U.S. related to the Iraq War and the Great Recession, mostly under Republican President George W. Bush. By 2010, after President Barack Obama's honeymoon was over, the Affordable Care Act became law and the Tea Party movement emerged as a political force, non-college whites' loyalties to the GOP were re-established, and they have become even stronger than before. Thus, it appears Trump has capitalized on white college nongraduates' existing preferences for the GOP more so than creating them. 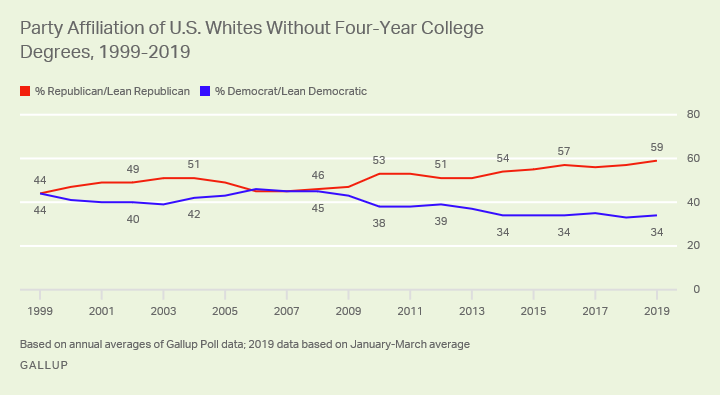 Still, the 25-percentage-point edge in non-college whites' preferences for the Republican Party (59%) over the Democratic Party (34%) thus far in 2019 is the largest in the past two decades, and is up from a 20-point gap in 2014. 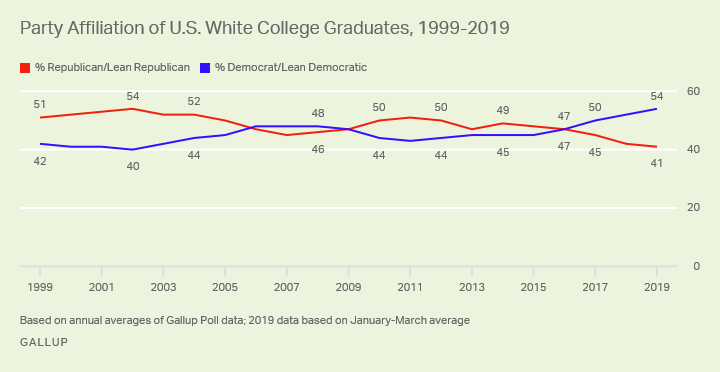 At the same time that non-college whites' attachment to the GOP has grown, there has been a shift in the political allegiance of whites with college degrees toward the Democratic Party. Since the 2016 presidential election year, white college graduates have gone from being evenly divided in their political preferences to preferring the Democratic Party by double-digit margins in 2018 (52% to 42%) and 2019 (54% to 41%). White college graduates' political affiliation was broadly similar to that of non-college whites until about 2011. Both groups showed a GOP preference from 2000-2005, became about evenly divided in their political loyalties between 2006 and 2009, and shifted back toward the GOP in 2010. However, college-educated whites did not swing back to the Republican Party during the later Obama years to the same degree that white college nongraduates did. Since 2014, white college graduates have shown at least some movement toward the Democratic Party each year. As a result of these trends, the proportion of the Republican Party consisting of whites with college degrees versus those without has changed. In 2014, 57% of Republican Party identifiers and leaners were whites without college degrees; now 59% are. Five years ago, 27% of Republicans were white college graduates, but that proportion has declined to 23% today. While education is a major predictor of whites' political loyalties, it bears little relationship to nonwhites' political preferences, which are heavily Democratic regardless. Among nonwhites with college degrees, 69% identify as Democrats or lean Democratic, compared with 21% who identify as Republicans or lean Republican. The figures among nonwhites without college degrees are 65% and 21%, respectively. 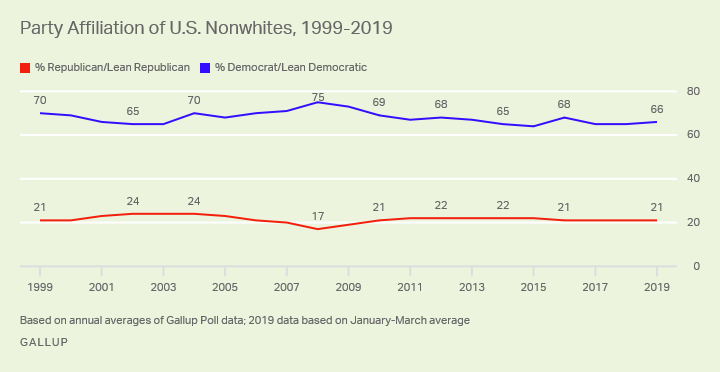 Nonwhites, regardless of education level, have shown strong support for the Democratic Party over the past 20 years, peaking at 75% in 2008 as Obama was campaigning to become the first black U.S. president. The recent changes in political affiliation of white college graduates, the presumptive swing group of the three, is not a positive sign for the GOP, and evidence of this came in the strong Democratic performance in the 2018 midterm elections. Adding to the challenge for the GOP is that the percentage of the population that is nonwhite has been growing, while the proportion of Americans who are white and do not have a college degree has been shrinking. Since 2014, before the unofficial beginning of the 2016 campaign and the Trump era, the percentage of Americans who are white without college degrees has fallen from 45% to 42%, while the nonwhite population has increased by the same amount, from 29% to 32%. The proportion of white college graduates has been stable during this period. Because nonwhites vote at much lower rates than whites do, the political advantages that accrue to the Democratic Party from nonwhite population growth are blunted to some degree. But most of the deficit in nonwhite voting is made up by white college graduates rather than by non-college whites, as was the case in the 2016 and 2018 federal elections, further underscoring the electoral importance of educated whites as a voting bloc. Proportion of electorate based on percentage of subgroup that was identified as likely voters in Gallup's final 2016 and 2018 pre-election polls. Percentages do not total 100% due to missing information on race or education for some respondents. Turnout has helped Republicans remain competitive in recent national elections to some degree, resulting in the party's winning not only the 2016 presidential election but also a majority in the U.S. House of Representatives in the 2010 through 2016 elections and a majority in the U.S. Senate in the 2014 through 2018 elections. The growing pro-Republican gap in party preferences among non-college-educated whites has probably helped the GOP in elections since 2010 more than turnout has. And changing U.S. demographics underscore the importance of the party maintaining or expanding that gap. Trump's politics and his policies on issues like immigration, the Affordable Care Act and abortion have arguably helped increase the party's appeal to whites without college degrees, but they may be a double-edged sword if it is also driving white college graduates away from the party. These trends have obvious implications for Trump and the Republican Party as they develop a strategy for the 2020 election and beyond. They can, as they did in 2016 and 2018, continue with a strategy to appeal mostly to the party base by emphasizing issues that can divide the country on values and possibly race. However, pursuing that strategy may further alienate college-educated whites, and make GOP electoral success more dependent on running up huge margins among whites without college degrees. Alternatively, Trump and the Republicans can try to expand the party base by trying to win back white college graduates. Even if that strategy were to turn off some white college nongraduates, presumably the party would maintain a healthy advantage among that group. If the GOP emphasizes the "appeal to the base" strategy in 2020 and it succeeds, that approach will probably not work for many more future elections if the demographic trends continue and the proportion of whites without college degrees in the U.S. population continues to shrink. Results for this are based on annual averages of Gallup telephone interviews with random samples of adults, aged 18 and older, living in all 50 U.S. states and the District of Columbia. The 2019 average is based on interviews with 6,026 U.S. adults. For results based on the total sample of national adults, the margin of sampling error is ±2 percentage points at the 95% confidence level. For results based on the total sample of 2,321 white college nongraduates interviewed in 2019, the margin of sampling error is ±3 percentage points at the 95% confidence level. For results based on the sample of 2,077 white college graduates interviewed in 2019, the margin of sampling error is ±3 percentage points at the 95% confidence level. All reported margins of sampling error include computed design effects for weighting.